I'm attempting to build a cart which will be steered with two deferentially driven electric motors. 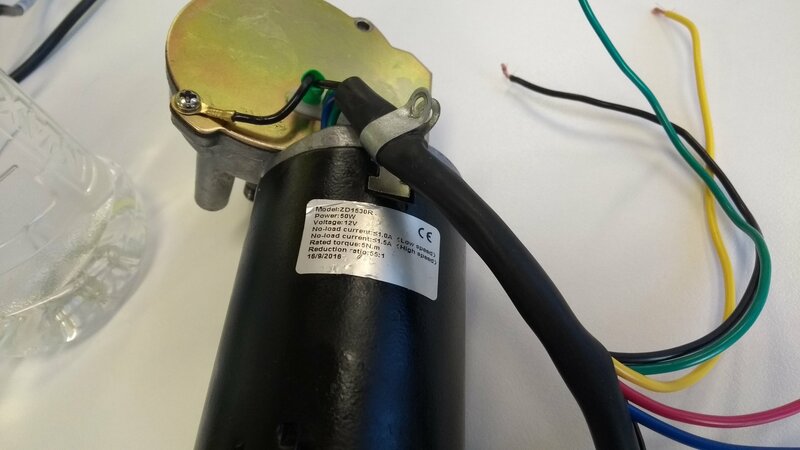 The motors I've chosen are and brushed DC worm drives, mainly for the high torque and low price. I believe the motors were intended for use as automotive windscreen wiper drivers, but the seller knew very little information about them. From testing and the poor information provided; powering the motor via the black and green cable drives the motor slowly, powering by the black and blue cable drives the motors at a higher speed, also if you connect blue and green cables its goes faster still. While the yellow and red cable seem to be used like some kind of an encoder (unimportant/unused). The Brushed DC wormdrive motor. The issue I'm having is the h-bridge motor drivers I've been using have been working for short periods of time before inexplicably dying. Testing various properties of the motors it was found that both the green and blue wires had low resistance paths to the chassis (approximately 1.2 ohms each). This occurs even when the screw seen in the picture of the motor connecting the back wire and chassis is disconnected. Would/could this be the cause of the fault? Does anyone have any insight of what could be happening with the motors internally? It's not a fault. This is normal coil to chassis DCR. The motor power and current rating I(rated)=Pm/V or Ravg=V²/Pm at max power. Thus Ravg=12*12/50=2.88 Ohms Although most DC motors have a DCR as low as 10% of the average effective resistance, these must be designed for low surge current or ~3x I rated max at 50W and 14.2V. Since the MOSFET switch shares the same current, it must be much lower than the motor DCR to avoid excessive heatsink costs, typically Rdson < 10% DCR or in thus case < 3% rated effective motor impedance or 10mohm to 120mohm with a strong preference towards the former. Not the answer you're looking for? Browse other questions tagged motor dc-motor h-bridge grounding brushed-dc-motor or ask your own question. Comparison of the efficiency of DC motor current limiting / control methods? What kind of motor is this? What is the type of this motor? Is it suitable for my project? Is there any way to run it on low VDC? Anything wrong with this Mosfet H-bridge?